We are happy to share with you the most recent release of Thinfinity VirtualUI 2.5, a web-enabling SDK solution for Windows Application Developers, offering both instant GUI Virtualization and Full Web Integration for Windows apps. 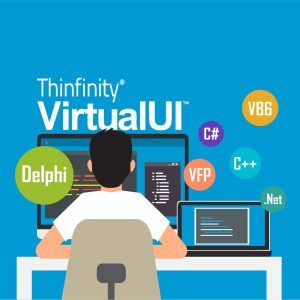 Thinfinity VirtualUI instantly web-enables Windows Desktop applications written in popular Windows development environments and programming languages: .Net (WinForms/WPF), Delphi, Visual Basic 6.0, Visual Foxpro, Gupta, Visual C++, and others. Developers who are looking to extend the life cycle of their application and convert Windows-based applications into multi-user, multi-instance web apps should take a look at it. From Windows to web, in minutes: no need to rewrite your entire code. Zero client setup: the resulting web application does not require any plugins, add-ons or additional installations on the client side. Multi-user, multi-instance: the new web application can be accessed from multiple concurrent users, instancing one app per end-user. Real integration capabilities: Windows applications can now be integrated with other web resources or applications, providing not only GUI remoting but also functional and data integration. Web Component integration: fully integrates Web Components or services (like Google Maps, Digital Signature, native HTML5 Video, etc) with the Windows GUI. Development Lab: the web environment lets developers see, test and interact with the Web-enabled Windows app and also work with the jsRO objects created in the application. Dual-platform – Windows/Web: all applications can keep their standard desktop environment behavior, or be accessed remotely from any HTML5-compliant Web browser, in a multi-user, multi-instance fashion. Enhanced end-user access schema: set anonymous or authenticated access with Windows Logon, OAuth/2 or RADIUS. Custom auth method using the Thinfinity Authentication API is also available. File System and Registry Virtualization: create a secure, controlled and isolated environment for each end-user, mapping and/or exposing only relevant application folders and registry entries. Support for multiple RDS sessions: increase the number of applications that can be run per server. Session recording/playback: users can save application sessions and replay them later. Ready to start? Check the product white paper for a tech insight and download the setup for a free 30-day trial. Would you like to have a private demo to learn more about Thinfinity VirtualUI? Contact us to coordinate a quick product demonstration.